Visit the Hoover Dam, including a guided tour of the Generator Room, on this 5-hour trip from Las Vegas. Skip the hassle of renting a car and relax during the drive to one of the world's modern engineering marvels. Visit to the Ethel M Chocolate Factory included. Pickup and drop-off at Las Vegas hotels. 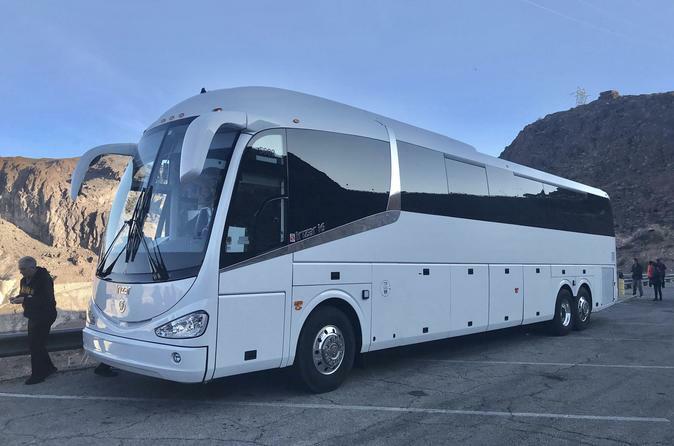 Enjoy convenient pickup at you Las Vegas hotel at 9am, then climb into a comfortable tour bus and relax on the hour-long ride to the Hoover Dam. Watch the scenery stream by as you listen to your guide/driver's commentary on the wonder of engineering you are about to visit. The bus is equipped with overhead media screens and restrooms. Once you arrive, embark on the Power Plant Tour with your certified Hoover Dam Guide. Get a look into the control room, home to the giant generators, as well as the underground hallways and caverns. Once you've finished exploring the dam, head back to Las Vegas, stopping at the Ethel M Chocolate Factory on the way. You can take a self-guided tour, including a free sample, and peruse the cactus garden if time permits. End your tour with drop-off back at your hotel.